Halifax in 1863. Opening of Dalhousie College. James Ross and his five professors. Charles Macdonald. James De Mille. Curriculum of the 1860s and 1870s. Dalhousie's students. Faculty of Medicine, 1868-75. 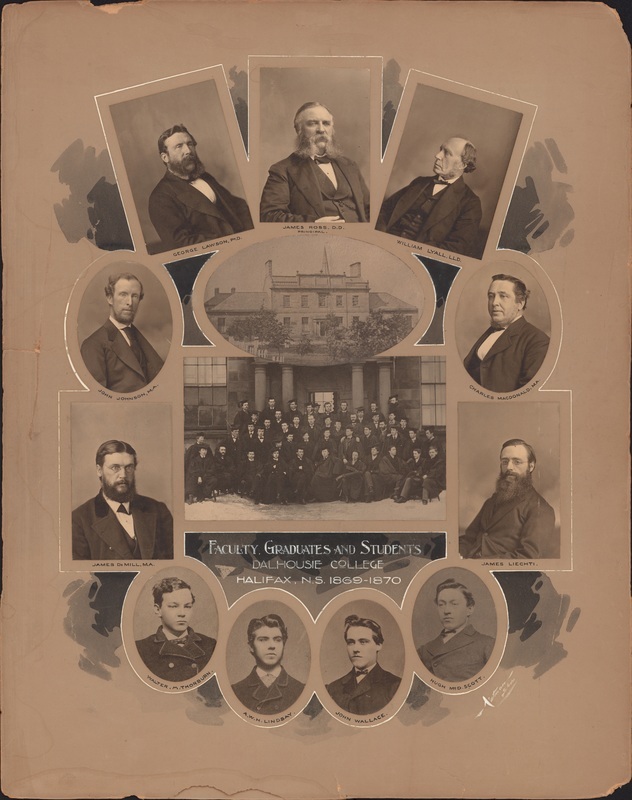 The University of Halifax, 1876-81. Penury. "The afternoon of Tuesday, 10 November 1863 was overcast; the wind from the northeast seemed to make the old wooden houses of Halifax huddle together as if for warmth. The grey smoke from the chimneys was blowing out toward the grey sea; there would be snow before morning. Dalhousie College was opening once more, for the third time. "The half-century-old grey stone building on the Grand Parade looked out upon a Halifax slowly expanding and improving. Fire hastened the process. Granville Street was devastated by fire in 1859, and it was then rebuilt in stone, a streetscape that is still attractive. The harbour’s forest of masts and yards was bigger, as were the wharves and the warehouses behind them. Halifax was still very much a military place, and it showed in the red uniforms of the British soldiers, in the blue of the navy, enjoying, or enduring, their lives in the most important military and naval station on the northwest Atlantic. "It was still dominated by the Citadel. The British army had started rebuilding it in 1828; it was at last finished in 1860 at a cost of £242,122, double the original estimate. After having strained the abilities, and as one historian suggests, the sanity, of a generation of military engineers, the rebuilt Citadel was rendered virtually obsolete by technology, by the hitting power of the new, rifled artillery. Few military men were fully aware of that yet, and the Citadel would remain occupied by British troops until 1907..."